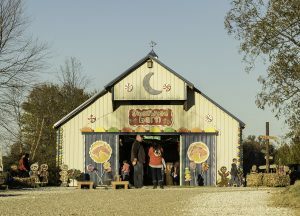 Kick-off your holiday season at Henderson, Kentucky’s Christmas on the Farm. Blue Moon Stables, a popular Henderson County horse farm, hosts this annual agri-tourism event. 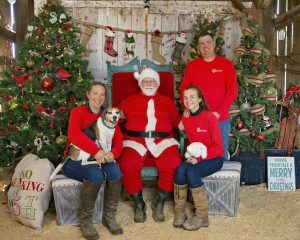 Christmas on the Farm has quickly become a holiday tradition for visitors and residents who are looking for good, old-fashioned joy and cheer to warm their hearts for the holidays. Here are six reasons you should high-tail it to Christmas on the Farm! 1. Pony rides, horse rides, and hay rides! – Do the kiddos have visions of Christmas ponies? Let the little ones enjoy a short ride on a trusty pony or horse. They will be smiling for days! Do you prefer wheels over four-legged and furry? 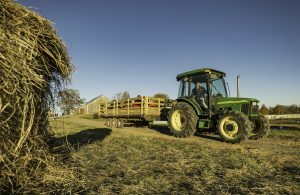 Grab your hot chocolate and tour the 100-acre farm in a tractor-pulled wagon, and hear stories about the family homestead, which has been in Geneva since 1888. Cheers to a side of history with your holiday! 2. Santa! – Even the jolly old elf himself will be spending the day on the farm, resting in his big chair, making his list and checking it twice. Santa will be available for children to deliver their lists and for professional photos. 3. Shopping! – You can check off everything on your shopping list all under one roof! 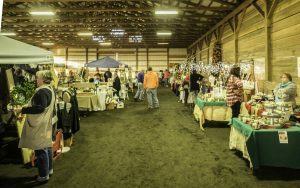 The indoor riding arena is loaded with local vendors and artisans. From milled soaps to one-of-a-kind jewelry, your holiday shopping list will be fun to fulfill without the hustle and bustle of busy retail stores. This event is a great way to support local shopping on Small Business Saturday! 4. Petting Zoo! – Get up close to pet and watch some farm animals, and maybe a few animals you wouldn’t expect to see on a farm! The petting zoo is housed in the Gingerbread Pony Barn, right next to the vendor arena. 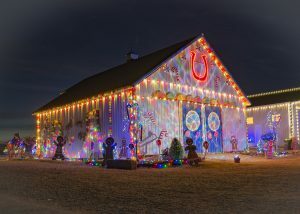 Be sure to view the spectacular Christmas light display on the Gingerbread Barn at night time! 5. Food! – Sample some local barbecue or hearty chili out at the farm! Don’t forget to grab a piping hot cup of cocoa. Grab a bite of your favorite western Kentucky flavors, or sample the sweets from the vendor booths in the vendor arena. 6. Giving Back! 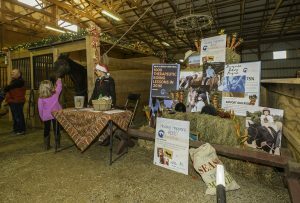 – Christmas on the Farm is an annual fundraiser for Healing Reins Therapeutic Riding. 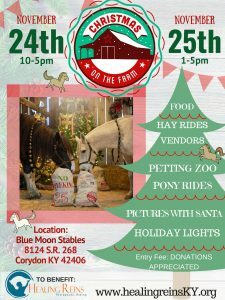 The proceeds from admission donations, Santa photos, pony rides, hay rides and food booth go directly to the program, which is a 501(c)3 nonprofit. 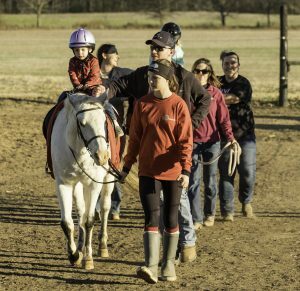 Healing Reins provides free riding lessons and activities to children and adults with special needs. Support a great cause while making lasting memories! Add Christmas on the Farm part of your family’s cherished holiday traditions. Mark your calendars for Saturday, November 24 from 10 a.m. to 5 p.m. and Sunday, November. 25 from 1 to 5 p.m. See you at Blue Moon Stables, 8124 State Route 268, Corydon, Ky.